In the late nineteenth century it was used to print the Treasure Island map of Robert Louis Stevenson, which was included in a rare first illustrated edition of one of the author’s most celebrated books. The two were brought together after the Grieg etching press was reassembled by expert Guy Brudenell at the new home of Edinburgh Printmakers in Fountainbridge. 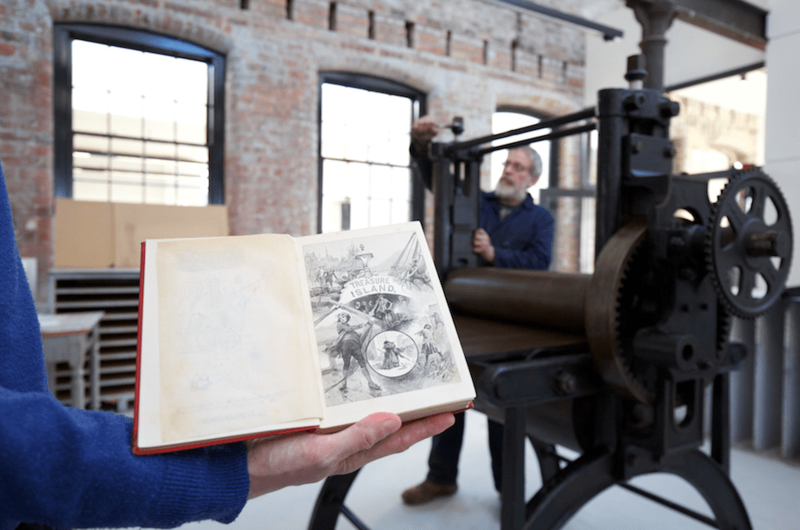 The book is part of The Mehew Collection of Stevenson works at Napier University’s Merchiston campus. The etching press was donated to Edinburgh Printmakers by the Bartholomew family. John Bartholomew Jr was commissioned to engrave the map of Treasure Island for the first edition in 1883. Stevenson created the map on a rainy holiday in Braemar to entertain his stepson but it got lost in the post on the way to publisher Cassell. Years later from France, Stevenson instructed his father to recreate the map who passed the drawing to John Bartholomew Jr.
Duncan Milne of the Mehew Collection explained that the book, published three years after the non-illustrated original, is worth up to £13,000. 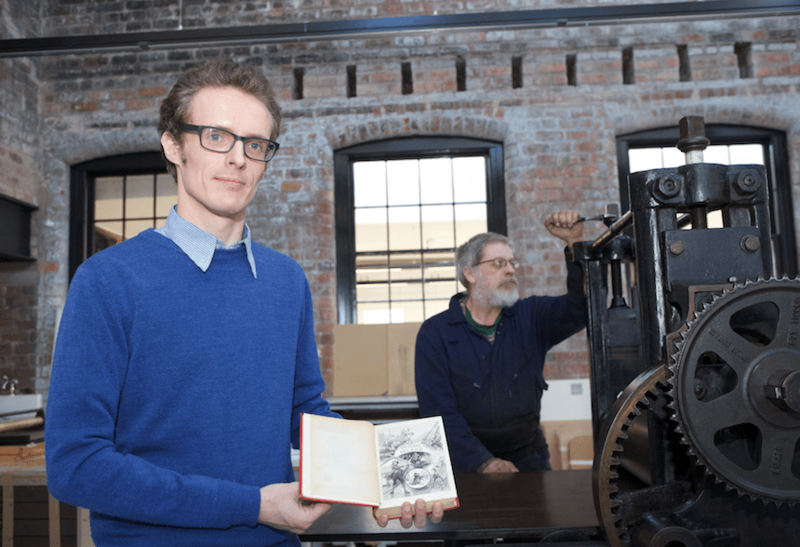 Edinburgh Printmakers, which is relocating from Union Street to its £11m new home in Dundee Street, will open to the public on Saturday 27 April with the art exhibition The Politics of Heritage vs. the Heritage of Politics by German printmaker Thomas Kilpper. Established in 1967 as the first open access studio in the UK, Edinburgh Printmakers is an arts charity specialising in printmaking. Castle Mills houses an enhanced open access print studio, traditional and digital processes, a dedicated learning space, artist accommodation, art galleries, a shop, a creative industries hub, café and print archive. It is set to be one of the largest printmaking facilities created for artists in Europe. The new building is 2194 sq metres compared to 939 sq metres at the present Union Street base. American businessmen and bootmakers Henry Lee Norris and Spencer Thomas Parmelee bought the canalside building Castle Mills Silks in 1856 and made it the headquarters of the North British Rubber Company. Their company soon grew and the present building was created in 1870 in Gilmore Park. By 1900 Castle Mills had become the largest industrial unit in Edinburgh, employing 3,000 people. With the start of the First World War came a demand for a durable, rubber-soled boot for the trenches. Commissioned by the Ministry of War, the Wellington boot was conceived in 1916. The North British Rubber Company set to work 24 hours a day, producing 1,185,036 pairs of boots for soldiers in the trenches. After the war the product catalogue ranged from sink plugs and domestic flooring, to golf balls and automobile components. In 1955, under the Hunter brand, two new boots were launched, the Green Hunter and the Royal Hunter, becoming a firm fixture in fashion for the next 50 years. Princess Diana famously wore a pair in her engagement photos in 1981, and the boots surged in popularity again after Kate Moss was seen in a pair at Glastonbury in 2005. By the 1960s the North British Rubber Company remained one of Edinburgh’s main employers, with almost every family in the local area having a family member employed at the mills. After a disastrous fire hit the factory in 1969, much of the production was transferred to other sites at Newbridge on the outskirts of Edinburgh and Heathhall, Dumfries. Four years later, most of the factory complex was demolished, leaving only Castle Mills on the site. Scottish & Newcastle Breweries took over the site and built one of the world’s most advanced canning complexes, with Castle Mills being used as a store and accounts office. The conversion of Castle Mills began in 2012, as part of the Council’s redevelopment plans for the area of Fountainbridge, supported by the Fountainbridge Canalside Initiative as well as the surrounding businesses. Page\Park architects design to ready the building for public use prioritises the importance of preserving the historic fabric as well as the industrial character. The building is a rare surviving example in the area of 19th century polychromatic brickwork. Conservation works included carefully cleaning and repairing the unique brickwork, fully refurbishing the original timber sash and case windows as well as restoring the slate roofs. Internally, remnants of a 1916 interior were restored including timber wall panelling and decorative plaster ceilings. 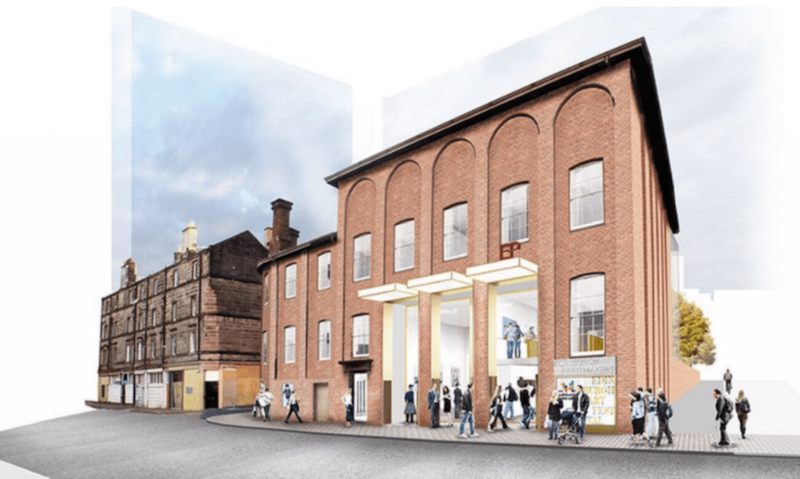 Amanda Catto, Head of Visual Arts, Creative Scotland, said: “We’re very much looking forward to the opening of Edinburgh Printmakers at Castle Mills – a world class centre for printmaking that will extend a warm welcome to all.